The first time Ousmane Bah was abandoned in the desert, it was June 2017. Five of the people he was with died. He was 21 years old and had left his home in Guinea a couple of months earlier, after his father was killed in a flare-up of political violence. Ousmane was afraid the killers would come for him next, so he decided to try to escape to Europe, where, he said, “they respect the law and human rights”. Guinea is part of the Economic Community of West African States, or ECOWAS, which has a visa-free travel arrangement for citizens of its 15 member countries. As Ousmane crossed borders on commercial buses, no one asked to see his passport or questioned him about where he was going. It was easy progress, that is until he reached the city of Agadez in Niger. Agadez has long been a hub for regional migration. Following the fall of Libyan dictator Muammar Gaddafi in 2011, it became the gateway for people travelling from West Africa to Europe via Libya. As hundreds of thousands of refugees and migrants began to arrive on European shores, the EU began searching for ways to stem the flow. On the route from West Africa, that effort focused on Agadez. Six months before Ousmane arrived in the city, the government of Niger had begun enforcing a law that criminalised the irregular movement of people to Libya. The view of those on the ground in Agadez is that tighter security has made the journey more difficult and dangerous. Migrants end up stuck in stark living conditions for months while they search for a way forward; drivers take riskier routes through the desert; and the number of people abandoned during the trip has increased. Facing such obstacles, some people give up and go home. But others still risk everything – even death – to get one step closer to Europe. Because the migration business has been pushed underground, there’s no way to tell how many migrants are stuck in Agadez while searching for a way to Libya. At the beginning of March, the International Federation of Red Cross and Red Crescent Societies warned of increasing humanitarian needs and “thousands” of stranded people. Local government officials say that the population of the city – around 120,000 according to a 2012 census – has doubled, or even tripled, in the past couple of years in part because of stranded migrants. But there are no reliable statistics. Temperatures in the desert around Agadez soar to around 55 C (130 F). There is no protection from the elements, and the trip across the barren landscape to the Libyan border takes three to four days. Still, being abandoned once didn’t discourage Ousmane from trying again. The first time, the driver who was taking him had been spooked when he heard that a military patrol was close by. He told the 25 people in the back of the pickup truck to get out and then sped off across the sand. 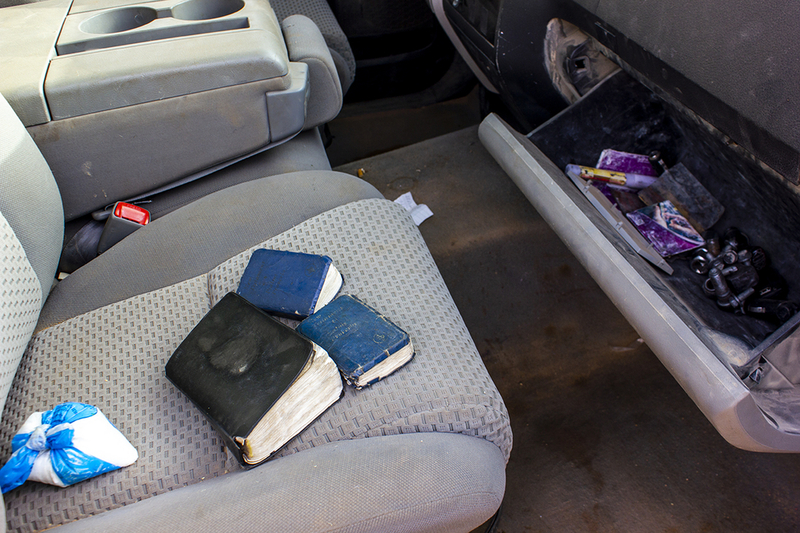 “He wanted to escape because when [the military] catch drivers they go to jail,” Ousmane explained. In a stroke of luck, a French military patrol from a base close to the Libyan border found Ousmane and the other survivors and brought them to safety. Three months later, Ousmane tried again. He left Agadez with 20 other people, including nine women and two small children. When they stopped for a rest, the driver told the passengers that he was going to a nearby town to get gas and food. “He took the vehicle with him [and] left us, just like that,” Ousmane said. The driver never came back. One day stretched into two, and then three and four. Again, Ousmane thought he was going to die. But on the fifth day, a trading caravan appeared on the horizon. Ousmane was rescued. Miraculously, this time, no one died. 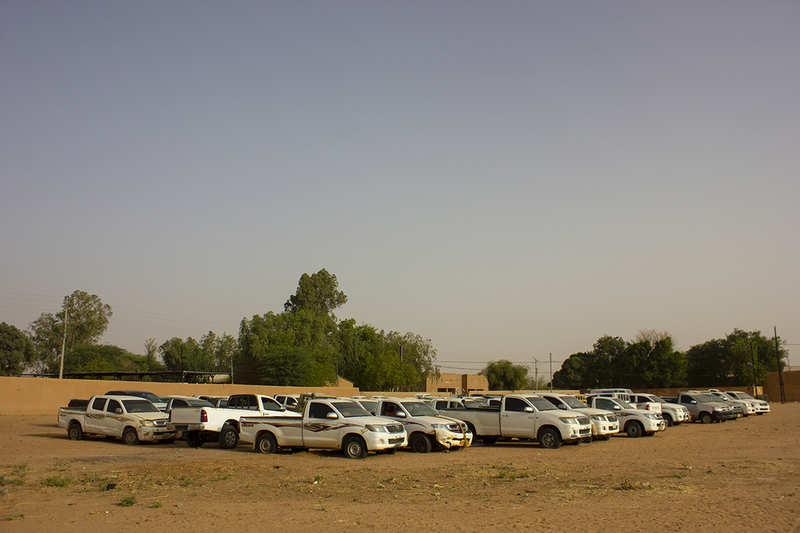 Smuggler pickup trucks impounded by the Niger military. The route from Agadez to Libya has always been dangerous. The desert is difficult to navigate, the environment unforgiving. If a lone pickup goes off course or breaks down, there is little hope its passengers will survive. Even before the anti-smuggling law, the corpses of abandoned migrants were found from time to time. People who reached Europe often told stories about callous drivers who left passengers to die when they fell out as the trucks bounced over the uneven terrain. For the EU, these stories are evidence that the migration business must be stopped: as long as it continues, the argument goes, migrants will be subjected to abuse by smugglers. But critics say that EU-supported policies are intensifying, not mitigating, the dangers and making the route to Libya even more deadly. Since the anti-smuggling law was put in place, the International Organization for Migration has recorded a “marked increase” in the number of migrants abandoned in the desert. Military patrols now monitor water wells and the most direct routes to the border, forcing drivers and their passengers deeper into the desert. 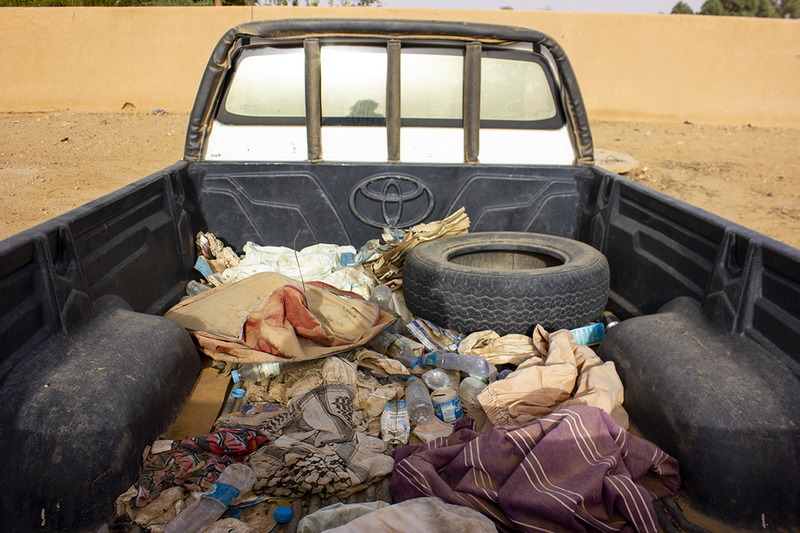 Among former and current smugglers and local government officials in Agadez, it is common knowledge that the fear of arrest is resulting in drivers abandoning their passengers when they suspect a military patrol is close by. Back in Agadez, survivors of failed desert crossings – and people trying to reach Libya for the first time – end up stuck in difficult conditions while they search for a way out. The tallest structure in the city is a centuries-old, eight-storey, mud-packed minaret. Most of the other buildings are low compounds surrounded by seven- to eight-foot tall red-brown walls. Each compound is like a small fort, with its outer walls concealing what’s inside. In the sprawling western suburbs of the city, where the roads are made of deeply rutted dirt and many homes have no electricity or water, a number of these compounds house migrants. People in Agadez call them ghettos. Before the law, their existence was accepted, but running a ghetto now can land someone in jail. Owners must either pay bribes to the police to turn a blind eye or migrants must play a game of cat and mouse to avoid being caught. Ousmane was staying in one of these compounds towards the end of March. Police had raided it the day before. He sat on reed mats on a dirt floor surrounded by graffiti-covered walls while sharing his story. There was no running water, electricity, or furniture in the house – only a small gas burner and a collection of battered pans stacked against one wall. Young men from various West African countries trickled in in their twos and threes; clothes dirt-stained and ripped. They didn’t all come at once, they said, because they were suspicious that a visitor might have been part of a police trap and wanted to minimise their chances of all being caught. In total, there were around 17 people staying in the ghetto. Several were clearly boys under the age of 18. “There are a lot of us who have been picked up by the police,” Ousmane said. Ousmane Bah, now 22, in a ghetto of Agadez. The anti-smuggling law criminalises the migration business, not people migrating. So Ousmane and the others aren’t technically breaking the law by being in Agadez. That, apparently, doesn’t stop the police from detaining them for two to three days when they are caught. “We spend the night here, and at 2 a.m., if the cops arrive, we leave running, only wearing our shorts, and then have to sneak back in like thieves,” Ousmane said. By March, this had been his life in Agadez for close to a year. He had paid $700 to the smugglers who abandoned him in the desert and was out of money. Even if he could afford it, he wasn’t sure he would want to try to reach Libya again after his two close calls. Returning home also wasn’t an option, though. He was still afraid of his father’s killers and had applied for refugee status with the UN’s refugee agency, UNHCR. After five months of waiting without news, he grew impatient and gave up. Some of the young men and boys in the ghetto were still trying to reach Libya and Europe. Others had given up. In mid-May, Ousmane ended up trying to cross the desert again. This time, he made it to Libya and was in Tripoli trying to find a way to cross the sea. Perhaps the best indication of just how effective the crackdown on smuggling has been is the number of people participating in IOM’s programme for assisted voluntary return. The programme – funded by the EU – helps migrants who decide to go back, for whatever reason, return to their home countries. In 2015 – the year before the anti-smuggling law came into effect – IOM assisted just over 1,700 people to return home from northern Niger. In 2017, the number jumped to more than 7,000. So far this year, IOM has already facilitated the return of over 5,000 people. Some of the people opting to return made it to Libya and ended up in detention centres or were forced into slavery. After escaping, they returned to Niger, according to Preato, the IOM programme manager. Others were rescued in the desert or ended up stuck in Agadez. Still others went to Algeria in search of work and were dumped in the desert north of Agadez after being caught up in what Human Rights Watch has described as a “wave of deportations” carried out by the Algerian government. Regardless, the decision to go home is usually an absolute last resort. Alasan Bah’s story is typical. One afternoon in March, Bah, a 33-year-old from Gambia, was outside an IOM centre in Agadez. He was sitting on a cinder block in the shadow of a wall doing the best he could to avoid the heat. About 15 other people were gathered around in the dust. All of them were waiting to return to their countries. The IOM centre in Agadez. His search for better opportunity took him to Mauritania, Senegal, Mali, and finally Algeria. “This bad road to Europe was not my intention,” he said. Instead, he was one of many young Africans migrating within the continent. But, after two years he was giving up. For many, starting from scratch while facing the ostracisation that comes with going home empty-handed is not an acceptable option. On an oppressively hot evening at the end of March, a 31-year-old from Sierra Leone who asked to be called Mousa sat at a table outside of a hotel in the Nigerien capital, Niamey. An diesel generator whirred in the background as he told the story of how his attempt to reach Europe stalled even before he could make it to Agadez. Mousa was born in one of Sierra Leone’s richest diamond-producing regions, but the profits from the trade didn’t benefit the local population. His education was interrupted by the civil war, which lasted from 1991 to 2002, and he wasn’t able to continue after his first year of primary school. Mousa’s opportunity to escape poverty came during the Ebola epidemic. His big break? A job with the Red Cross burying the bodies of people who had died from the virus. “We buried more than 20 to 25 people per day – women and children,” Mousa said. He was also frustrated by Sierra Leone’s political class, which he said enriched itself from corruption instead of creating opportunity and a social safety net for the poor. “We look at all these things and we say: ‘Here is not a place to live.’ So we have to go and find another place,” Mousa said. Before leaving Sierra Leone, Mousa already knew about the crackdown on migration in Agadez and the dangers of crossing the desert. He had heard the reports about slavery, kidnapping, and torture in Libya and the stories of shipwrecks and people drowning in the Mediterranean. He even knew about the hostility directed towards African migrants in Europe. None of it deterred him. The way he saw it, he was born poor in Africa, and if he stayed on the continent, he would die poor, too. Compared to that fate, the risks involved in trying to reach Europe seemed worth it – regardless of the obstacles the EU tried to place in his way. “Either you die or… you make it,” Mousa said. The arrival in Agadez of the Sudanese – most driven from their homes in the conflict-ridden region of Darfur more than a decade ago – signalled something new: it was the first time a group of refugees and asylum seekers had travelled south from Libya in search of protection instead of north towards Europe. Once the first group arrived, more kept coming – until there were around 2,000. European policies have led to a nearly 78 percent drop in the number of people crossing the sea from Libya to Italy since July last year, but the fact that the Sudanese were compelled to head back to Agadez and that their tense reception ultimately resulted in the deportation of 132 people back to Libya speaks to a broader truth: the international refugee protection system is failing.